Sound — we’ve all used it as a form of therapy. Whether it’s to relax after a hectic workday, groove during your morning run or howl out after stubbing your toe, sound has always served as a form of expression. Now, it’s becoming a new phenomenon as people are using the vibration of their voices and objects to ease discomfort. 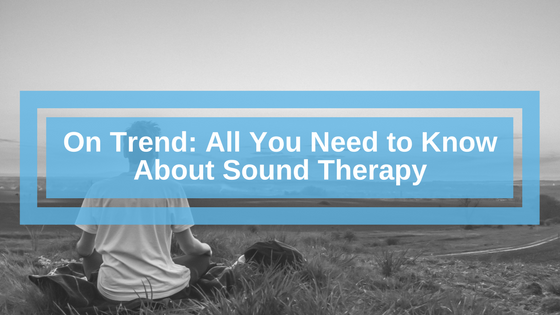 Get on trend and learn all you need to know about sound therapy below. Sound therapy is similar to meditation. Just as you monitor and control your breathing with meditation, you regulate the frequency and rhythm of noise in sound therapy. But, how does that alleviate pain? Noises create shifts in our brainwaves through entrainment, which is when your brain synchronizes its waves to an external stimuli’s rhythm of frequency. Aligning your brainwaves to a certain frequency can cause a physiological reaction. Physiological reactions are often stress-related, such as an increased heart rate. With sound therapy, your body’s physiological response is positive. You release nitric oxide, a molecule responsible for expanding blood vessels, increasing blood flow and influencing pain signals. The key to sound therapy relaxation is calming your mind and body, which allows entrainment to occur. Many people opt to lay down and close their eyes, for example, during a session. A less natural approach to sound therapy is ultrasounds, which also create vibrations and are used for treatment on occasion. Sound therapy, however, is a more natural approach that doesn’t require a visit to a hospital or that you wear a dressing gown. What Conditions Does Sound Therapy Treat? Sound therapy is also a helpful educational tool for children with ADD, ADHD and autism because it retrains how sounds are processed. This is beneficial because ADD and ADHD make it difficult to tune out certain noises and focus. The leading reason for using sound therapy is because of its health benefits. People have found relief from back pain, cancer treatments and more by trying the alternative therapy. For many, the treatment also alleviates stress, which helps your overall health. 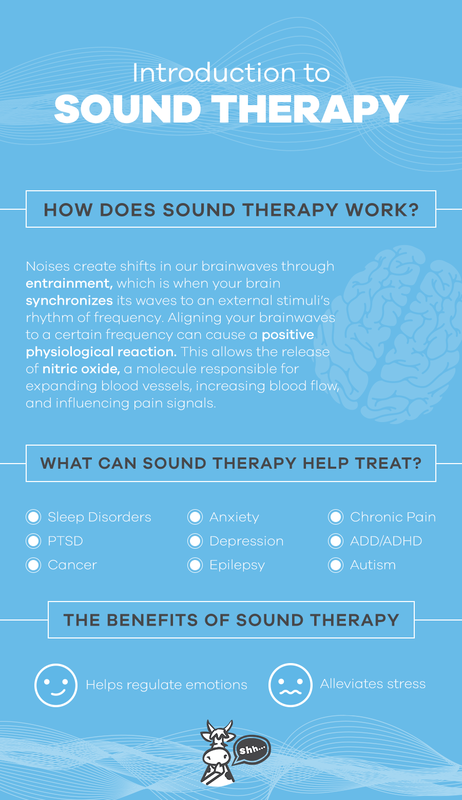 The benefits of sound therapy also include the fact that it’s a natural treatment. It doesn’t require health insurance, visits to your doctor or invasive procedures. You go, relax and leave refreshed. In some cases, sessions are as short as ten minutes, which means you don’t have to skip Netflix to go. Sound therapy isn’t a cure, but it’s a healing technique. For some conditions, like chronic pain, your focus isn’t on curing it, but managing it. Easing your emotions is another benefit of the alternative treatment. Cancer patients, for example, have used it to express their fears and other emotions. Practitioners of sound therapy also note that loud environments, like the city, can shift our relationship with sound. Instead of therapeutic, it’s stressful. Sound therapy resets that relationship and helps you become a better listener and more aware of what you’re hearing. So, instead of focusing on the jackhammer outside your building, for example, you hone in on other sounds, like the tiny chimes on your desk. Interested in learning more about sound therapy? So are we! At Soundproof Cow, we’re udderly focused on sound, which is why our blog offers tips, news and techniques on noise and soundproofing. Subscribe to our Bull Bulletin and we’ll let you know when our herd has more news to share.